Welcome to Claire’s 3rd and final week of being broody. Over the weekend, we entered the ‘lockdown’ phase, as it’s called when you’re incubating eggs to hatch. This is the last three days (or starting on day 18) of the hatching process when the chicks need to maintain a certain temp and humidity in order to hatch. On an incubator, there are dials and gauges to tell that. How a hen knows, I can’t tell you but Claire didn’t leave the nest at all yesterday and spent most of it in a glassy-eyed fog. I fed her eggs yesterday at dinner time and likely will today, as well. She’s not as thin as Abby was but I’ll still give her some. Tomorrow is the first potential hatch day. In prep for Claire and her babies to join the flock, I did a Thing. Those who remember back to November when Pip was hatched, I put Abby and baby Pip in huge box, shoved under the laying beds. One half of the box was nest and the other was for food and water. It worked for them but the box was in the way and after they stopped using it, Abby would sit in the middle of the coop with Pip and just expected everyone to stay out of their way. This would be why 1- Pip thinks the coop is His Domain and 2- all the older hens still find Pip vaguely annoying. Well, I realized today that in roughly 48-hours I will have the same situation, on with 1-4 chicks, instead of one. AND on top of that, in a handful of weeks, I will integrating the Littles into the big flock. Does anyone else see a recipe for potential disaster? 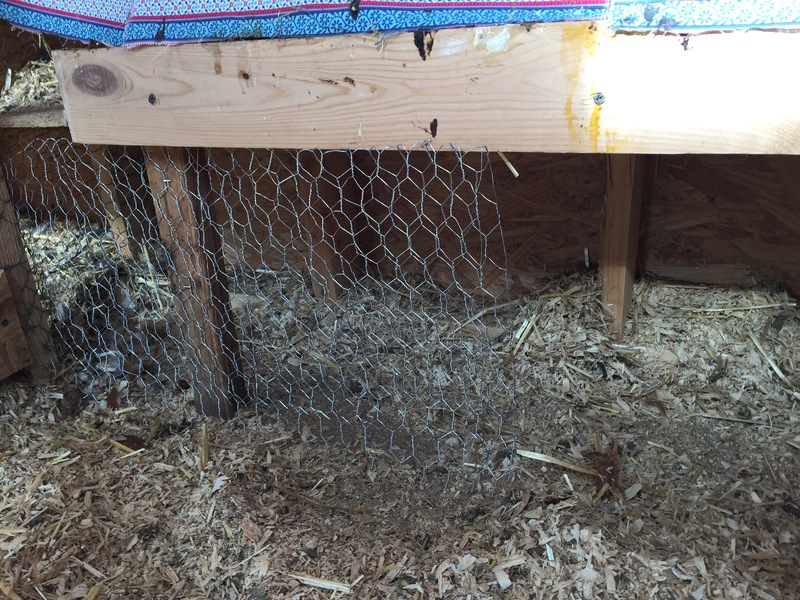 I cleaned out (a little) the underneath area, where the chickens don’t really go and haven’t used since the were babies, stapled chicken wire in two sides with an opening in the middle, and creating a … maternity ward? Nursery? 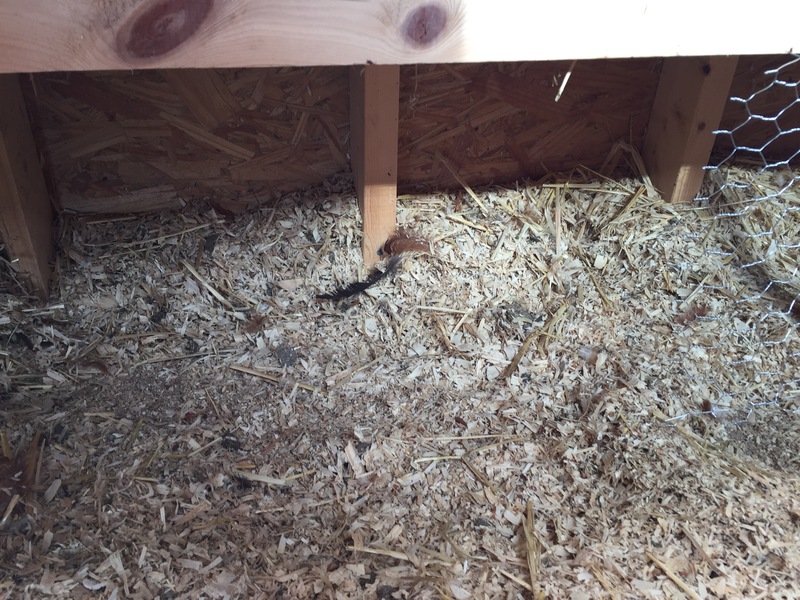 If Claire accepts it, this unused space can be a place for a her baby nest, offer shelter and a safe place for her wee Littles to play … and it won’t take up any room in the coop that the older hens actually care about. 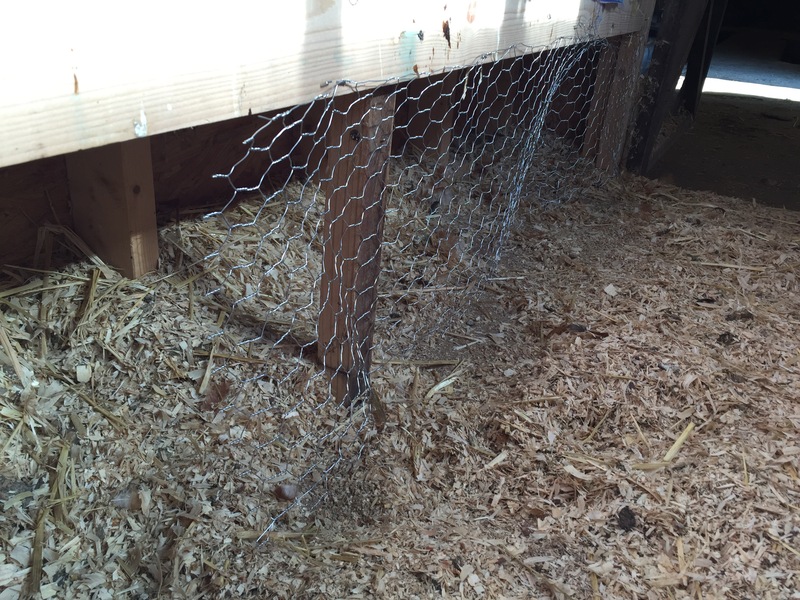 Setting it up now means the older chickens have a couple of days to get used to it being there. I know! But only if Claire sees my logic. If she views the idea with Chicken Logic, I would be screwed. I love this idea! We just had one of ours hatch an egg and I will be coming up with something in the next few weeks for mom and baby. Right now we are headed down the Pip route of being raised. Can’t wait to see Claire and her babies!! As much as I love Pip – ans we ALL know I do – I will never give just one egg again, even if more than one hen goes broody at the same time. Pip was so lonely after he got a little older and once he got big enough for Abby to stop protecting him (about 7 – 8 weeks, I think. It was winter by then so she didn’t mind him cuddling for warmth most the winter), he spent a lot of time following far behind the flock. If that other egg had hatched too, I think he wouldn’t be quite the loner he is now. He’d have had an age-appropriate friend to be with. I hope my little idea pans out, too. Sadly, chickens don’t work on the same logic we do. So while I see a good use of unoccupied space, she might see something entirely different. We’ll keep our fingers crossed, though! Yeah, I wish we had thought it all through better. We had gotten the four babies from the store and had meat birds coming as well and figured there would be plenty of babies around, but then she switched the nesting boxes up and we started over several times, now all the other babies are in their teenage years. I may toss Momma and baby in with the 4 young egg layer to be chickens and hope they bond. But you are right, they certainly don’t share the same thought process as we do! 🙂 Keep posting updates on your new babies! !